As a pioneer and driver of innovative automation solutions, KUKA do not define standards by what already exists, but by the manufacturing needs of the future. In 2004, we set a milestone in the history of robotics with the world’s first cobot (collaborative robot) the LBR iiwa (intelligent industrial work assistant). Since then, we have merged additional strands and interwoven them to form novel production landscapes in which humans, technology and data streams are fully networked. 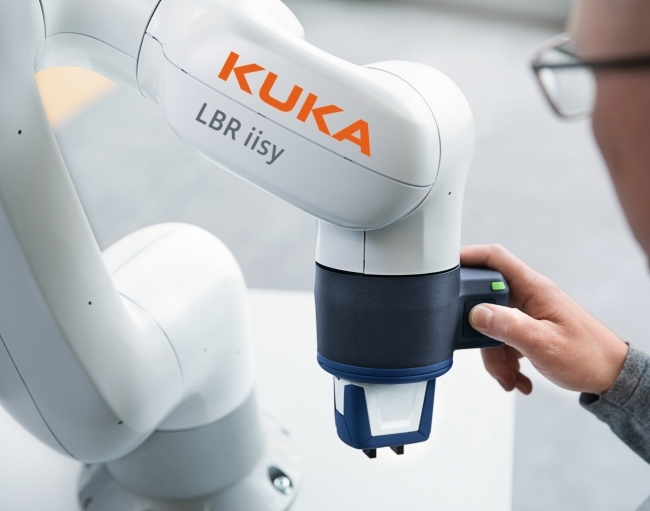 The LBR iisy technology is based on KUKA’s LBR iiwa and the KR 3 AGILUS and can master diverse worlds of production. The cobot supports all major industry-standard functions such as OPC UA, field bus protocols, digital and analogue I/O’s, safety and much more. As a result, the LBR iisy can be immediately integrated into any existing industrial environment. Not only is it easy to operate, but is also highly versatile. Whether for loading or unloading machines, packaging, precise testing, reliable assembly, handling or difficult research tasks – its payload of 3 kg and reach of 600 mm are perfectly suited to the challenges of confined workspaces, and even in the event of unplanned interruptions, it remembers every motion or activity executed and can resume working without the need to be retaught.